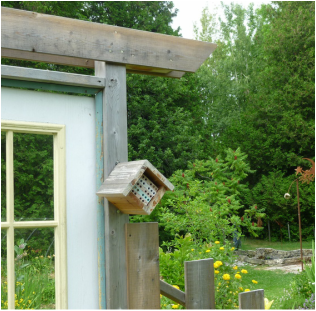 BEE HOUSE - BEE AT HOME!!! A DELICIOUS MEAL on coryopsis. "POLLINATOR ARE RESPONSIBLE FOR ONE OUT OF THREE BITES OF FOOD THAT PEOPLE EAT"
That fact alone should have up looking at birds, bees and butterflies with a whole new level of appreciation and respect! Lots of us know that it's important to create a friendly environment for pollinators and including some plants to attract them to our garden is a good start. Some plants at Earthbound Gardens seem to be particularly delectable to bees, butterflies and birds: in the flower garden, butterfly flower (asclepias), asters, lavender, catmint (nepeta Walker's Low and achillea Moonlight look particularly nice together), daisies of all kinds, liatris, coneflower, ironweed (beautiful native plant) and goldenrods (try them...you'll like them!). Don't forget to include flowering shrubs and trees - our "Miss Kim" lilac is covered with swallowtails every summer. In the vegetable garden most herbs, squash and pumpkin and berry bushes. Birds love any fruiting tree as those of us who try to actually harvest and cherries or mulberries know!